Here's a fun recipe to try with your kids during the holidays. 1. Prepare boxed brownies according to directions on the package. 2. 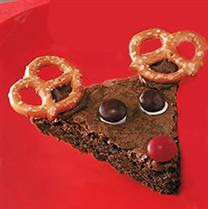 Add "antlers" by attaching pretzels with chocolate frosting. 3. Add a red m&m with chocolate frosting for the nose & brown m&ms with vanilla frosting for the eyes.